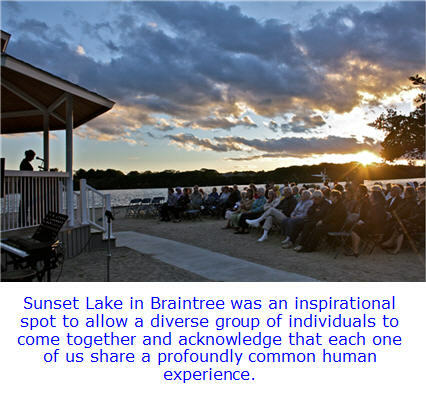 On a cold and windy evening in June, about 150 people in Braintree gathered together at Sunset Lake to pray. It was the second year the numerous churches in Braintree came together for a non-denominational service held as part of a National Day of Prayer designated by Congress in which citizens are asked to "turn to God in prayer and meditation." The Congress, by Public Law 100-307, as amended, has called on the President to issue each year a proclamation designating the first Thursday in May as a "National Day of Prayer." President of the United States of America, Barack Obama, proclaimed May 5, 2011, as this year's National Day of Prayer. The presidential proclamation reads in part: "I invite all citizens of our Nation, as their own faith or conscience directs them, to join me in giving thanks for the many blessings we enjoy, and I ask all people of faith to join me in asking God for guidance, mercy, and protection for our Nation." First Congregational Church of Braintree, United Church of Christ --a member of the Braintree Interfaith Clergy Association -- joined several other churches and a synagogue for this service of prayer and music from all faiths and beliefs. The location was chosen because it was a central spot in town, had a gazebo and parking, and was neutral to the community. The evening consisted of alternating prayers and music from different worship communities, individuals and small groups. Pastor Rev. Leanne Walt was among the prayer leaders, church member Breanna Hewson offered her gift of song on behalf of First Church, and about 20 members supported the event. "Despite the weather, it was a beautiful evening filled with prayer and music," said Carl Francis, a deacon at the church. "I arrived a little late, but it was nice to notice so many familiar faces among the crowd when I got there." The mayor, also in attendance, spoke at the event and asked to pray for the victims of the tornadoes that struck western Massachusetts. Refreshments were served afterward to promote mixing different congregations, creating an all-town activity. Rick Durham, church moderator, said: "I think many of us tend to bicker about the differences in our beliefs -- Catholic vs Protestant vs Congregational vs other types of religions. But we are all under one God and it really doesn't matter. This was a nice way of celebrating God and not being partisan about it." "As religious leaders, it is vital that we provide opportunity for productive and peaceful ecumenical relationships between people of all faiths and religious traditions," said Walt. "An event like the Day of Prayer allows a diverse group of individuals to come together and acknowledge that each one of us share a profoundly common human experience; one in which we are constantly seeking the good, for our children, for our local community, for our nation, and our world. And, one in which we are seeking a closer relationship with the divine. As we prayed in the wake of the tornadoes that struck our westerly neighbors, we recognized also that there are moments when the hands of nature remind us just how deeply our common humanity runs." Francis said: "I think that ecumenical events are good to put God first among all your neighbors, not just the ones that worship at your church." Rev. Walt can be contacted at the church office at 781-843-3616 or office@firstchurchbraintree.com.